Motor & Cycle Accessories in pre-war Salisbury. Homepage. This page: Pre-war supplier of motorcar, bicycle and garage equipment situated on Winchester Street. Ewen Limited - Motor & Cycle Accessory Factors. 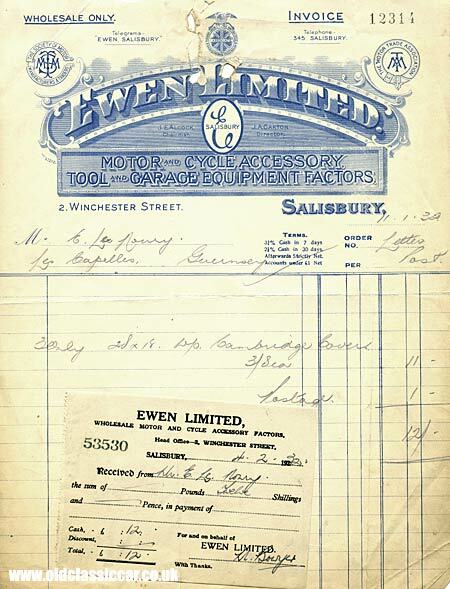 Ewen Limited, of 2 Winchester Street in Salisbury, were wholesale suppliers of motor & cycle accessories, tools, and other garage equipment to the Motor Trade. This invoice is dated 11th January 1932, and was issued to a gent who's address was "Les Capelles", on Guernsey. The invoice relates to the sale of 3 Cambridge covers, total cost including postage to Guernsey, 12 shillings. Ewen Limited were headed by a J.E. Alcock (Chairman) and J.A. Garton (Director), and were members of the SMMT (Society of Motor Manufacturers and Traders), Associate members of The British Cycle & Motorcycle Manufacturers & Traders Union Ltd, and also the Motor Trade Association. Does anyone remember this business? whether they traded solely in the pre-war years, or continued selling motor & bicycle parts into the 40s and 50s, I don't know as yet. This invoice is another reminder of how nicely illustrated some of the early 20th Century business invoices were. Several more motor-trade related examples can be found in the Motoring Collectables section, many of which also date to the 1930s.